Hedwig held over, a special closing night planned! We’re thrilled to announce that we’ve held over our run of Hedwig and The Angry Inch, originally scheduled to close Sun., Sep. 9. The show will now close on Sat., Sep. 15. Performances have been added at 8pm on Thu. and Fri. Sep. 13 and 14 with a final performance to take place at 10:30pm on Sat., Sep. 15. The shows closing number, “Midnight Radio,” would then finish out the show around midnight! Tickets to all shows are on sale now. * The Beatles’ “Come Together” sung by Hedwig director David M. Jenkins. * Dolly Parton’s “9 To 5” sung by Sara Rose Band’s lead singer Sara Hagan. * Aretha Franklin’s “A Natural Woman” sung by Jobsite Artistic Associate and Florida Bjorkestra member Colleen Cherry. * David Bowie’s “Rebel Rebel” sung by Ricky Wilcox of Deloris Telescope fame. 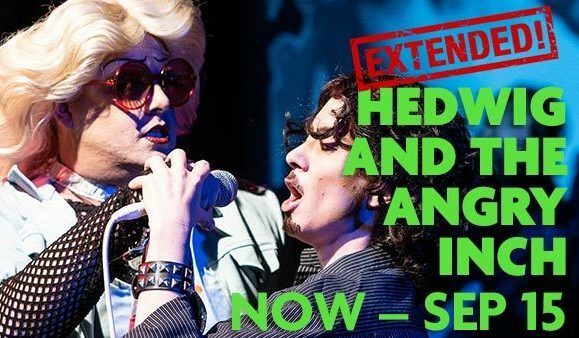 Tickets to Hedwig and The Angry Inch continue to fly out the door with performances selling out in advance. Book today to secure the performance you want at the best price. Single tickets increase by performance based on demand. Planning of making a night of it! Getting a room at the Barrymore for the night. So excited!